This unique property sits on its own promontory, the highest point in the Gers, giving all round stunning views to the Pyrenees and surrounding countryside. It is very private and secluded and has professionally landscaped gardens to the front and south. To the west is a wooded area with a natural pond. The house sits on 2.3 hectares of land, which is easily maintained. The house has recently been extended and renovated to a very high standard. Well insulated and double glazed the geothermal central heating makes it efficient to run even in the coldest weather, including the heated indoor swimming pool. Whilst being spacious it is manageable and equally suited for a holiday or year-round home. Entrance is through an internal courtyard (33m2), which provides a charming summer eating area. The Dining room (45m2) has a stone fireplace, with Toulouse brick decoration, wood burner, and exposed beams. Stairs with handcrafted wrought iron railings lead up to a mezzanine level. The lounge (38m2): with dual aspect, facing the Pyrenees, with exposed beams, Stone fireplace, French doors leading to the orchard. The kitchen (27m2 – recently refurbished Mobalpa kitchen), includes Bosch appliances and American fridge, central tiled island unit with breakfast bar. This spacious room also allows for informal dining. There is a snug study with fireplace, next to the kitchen. On this level there is a guest toilet with walk in shower. Laundry area and boiler room opens onto a large workshop and store. A large mezzanine provides room for a television lounge (37m2) and leads to all the main bedrooms. This area and three of the bedrooms have reversible air conditioning. The master Suite (26m2) has an ensuite with a walk-in shower, a large bath and French windows which overlook the pond and wooded area. The master suite also has a dressing room and from the bedroom there is a covered terrace with spectacular views of the rolling countryside with the Pyrenees as a backdrop. Bedrooms 2 and 3 (14m2and 16m2) have a shared bathroom with walk-in shower and Victorian style bath. Bedroom 4 (26m2) has wood floors and a fireplace. Beautifully decorated, ideal for Chambre d’Hote. It has a large ensuite, and a separate private staircase leading down to the Pigeonnier and the gardens. There is another room which is used at the moment as a sewing room but can be a bedroom. This room has a fitted worktop with plugs, storage and French doors overlooking the gardens. From the internal courtyard, doors lead through to the Orangery / Fitness room (20m2) which includes a wet room. Double glazed doors open through to the pool room. The heated pool is used throughout the year and Bifold doors on two walls open onto the garden in summer. The traditionally built Pigeonnier provides a shaded and sheltered dining and entertaining area. A spiral staircase leads up to an eyrie under the intricate wood roof with views of the countryside. The grounds are well maintained, and the property sits at the end of a long drive. 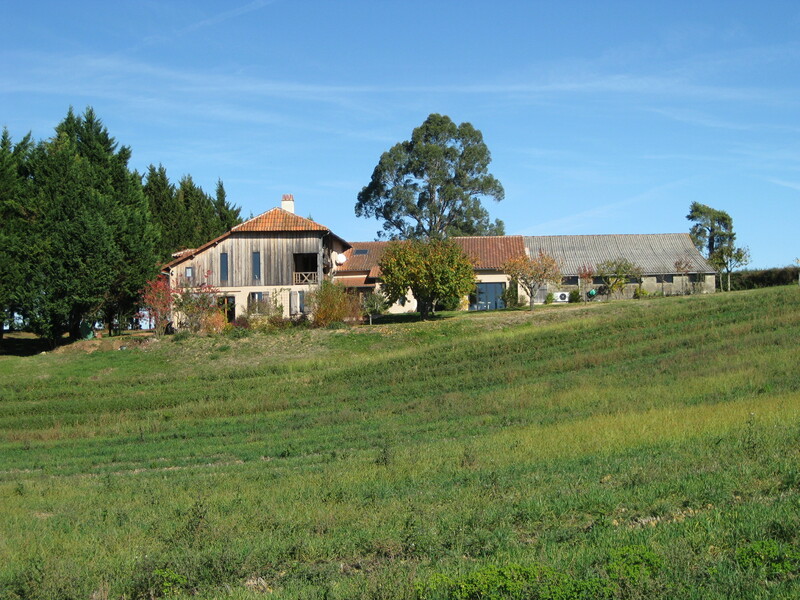 There is an attractive open barn (130m2) to the side of a gravelled courtyard, which provides ample parking. There is also a garage. Here at Bliss we particularly like: the beautiful indoor swimming pool, the private landscaped gardens.